It’s not the classic turkey habitat most hunters think of. The hardwood ridges of my native Southwest Wisconsin are hundreds of miles away. Elms and maples take the place of oak trees in this story. A muddy, freshly planted Illinois corn field lay before me on this morning. The land is flat as a pancake but wild turkeys are thriving here. The gobble of a veteran tom at sunrise is met by several responses from a nearby fence row. As the sun continues to peek over the horizon, the sound of air passing through several sets of wings. The gobblers I seek are now on the ground. After a few yelps on my box the first tom shows himself. He goes into strut mode upon seeing the decoy. But it doesn’t take long before his tail feathers go back down and he begins his trot to my location. A flock of geese call out from overhead and he stops to gobble back at them. The tail feathers go back up as he starts another dance. His display gets the attention from another tom. This one appears from behind me and cuts off my original bird. The pair double their size instantly as they competitively puff up their feathers. A truce is called before a winner is declared and now a duo of gobblers is on their way to romance my hen decoy. As they approach my faux fowl, they hit the brakes and display once again in an attempt to impress her. The second bird pops his head up to my cluck. It is the last time he voluntarily stretches out his neck. I tap the trigger as I exhale and he folds up in a pile of feathers. As I scoop him up by the feet, his spurs serve as a nice handle to carry him. They are at least an inch long and his beard doesn’t disappoint either. How old is this turkey? It’s hard to tell. Aging a wild turkey is not an exact science. Knowing the difference between a juvenile bird, also known as a jake, and a mature gobbler is simple enough. 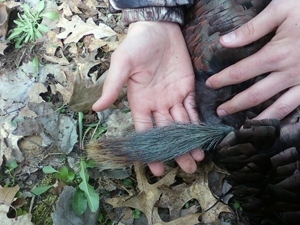 The tail feathers on a jake will be irregular when they are fanning. The middle feathers will stand higher than the feathers on the side of the tail. Their beards stick out instead of down and usually measure just two or three inches. A mature gobbler’s beard hangs down and may even drag on the ground when they walk. After putting a gobbler on the ground, most hunters want to know how old the bird is. If the spurs are between a ½” and an inch, there’s a good chance the bird is a two year old. These spurs usually protrude straight out. If the spurs are over an inch long and have a curve to them, this gobbler is more than likely three years old or older. These are known as limb hanging spurs. You can literally hang the turkey on a tree limb by the spurs. Measuring beards is another way to age a gobbler. A two year old tom will have a 5 to 7 inch beard. 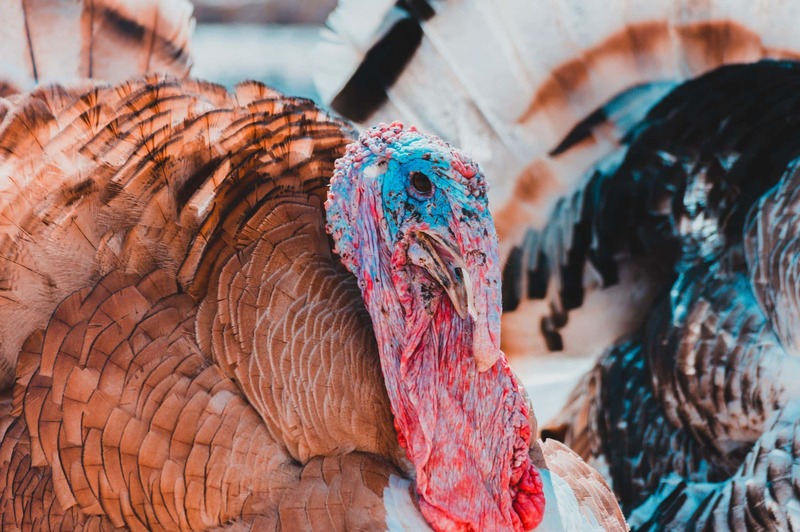 A three year old turkey’s beard typically measure eight inches plus. Again, the math gets fuzzy from this point as well. The beard of a wild turkey continues to grow throughout life. A beard of 12 inches or more is possible. However, the ends of the beard will wear off as it drags on the ground. This is especially true for turkeys in rocky habitat. Ice will build up and break sections of the beard off in cold climates. These measurements are good rules of thumb, but you can never be certain. There are a lot of environmental factors affecting how a turkey ages. Wildlife studies have shown some birds lost length on their spurs as they age. This is especially true if a gobbler survives to five years of age. Aging a turkey up to three years old is fairly simple. However, it is nearly impossible to age a turkey beyond three years of age. How much did it weigh? Weight is one of the first things many hunters ask when you tell them you got a turkey. Weight is a good indicator when it comes to offensive lineman. But it’s not going to tell you much about the age of a turkey. Habitat and food availability are the main factors there. I’ve killed jakes that pushed the scale at nearly twenty pounds during hunting seasons after a mild winter and mature gobblers as light as 18 pounds after harsh winters. These were both birds living in the same approximate area. Take weight out of the equation. Beard size is a good measuring stick. A jake is typically going to have a three to four inch beard. Of course, it’s pretty easy to figure out the age of a jake. As a male turkey ages, his beard continues to grow. A gobbler with a six to nine inch beard is usually a two year old. These beards on these birds will often have an amber tip. At three years old the beard will typically grow to about ten inches. Once they reach ten inches long, beards will tend to wear down as they get dragged on the ground. Of course, turkeys with multiple beards will grow them at a different rate as well. A turkey’s spurs may be the best way to judge it’s age. A jake’s spurs will often be less than a half inch long. At two years old a gobbler’s spurs are typically between a half inch and 7/8 of an inch. If your gobbler sports 7/8 inch to inch and a quarter long spurs, he’s probably a three year old. Longer than that and you’ve got yourself a wily old veteran.